Beef rice noodle rolls (cheong fun) dim sum style served on a plate with some light soy sauce. Such a delicious treat is popular with most overseas Chinese restaurants. 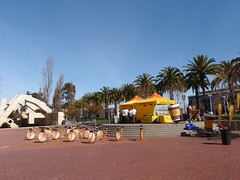 San Francisco – March 9, 2010: Jamba Juice Booth with stationary bicycles promoting product in Plaza. Jamba Juice Company is an American restaurant retailer.